It is a little late for this (some people are dumbasses when it comes to downloading photos off a camera), but here’s a photo of Mauricio Capistran (a.k.a. 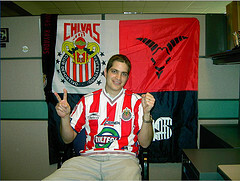 Picho) showing the score of last weekend’s match America VS Chivas of Guadalajara. He and Alejandro del Castillo (a.k.a. too many things to list in this reduced space) bet that whoever’s team loses the Superclásico would get to proudly pose wearing the winner’s jersey and remind the world what the final score was. Of course, the photo eventually makes it to the internet and the rest is history. Some people shouldn’t have so much faith in their teams (that last link you gotta click on). Next weekend the Clásico Regiomontano is played… any takers among the few remaining fans of Tigres out there?